When discussing a project online, sometimes it is very difficult to explain what needs to be done and providing a screenshot can be tedious because you need to circle the area where you want the attention to be placed on. Other than that, language can be a barrier when either one doesn’t speak fluent English. Probably the best way is to create an online meeting that is able to share your screen while simultaneously chat or talk to the project manager. The ability to record or save the meeting is also very important so that both parties can refer back the agreements and what needs to be done. Recently I needed someone to help me work on something and I want the discussion to be completed as soon as possible. I remembered that I reviewed Mikogo before which was pretty good but I needed something more advanced that allows me to record the meeting and also possibly speak to the other parties using a microphone through VoIP. 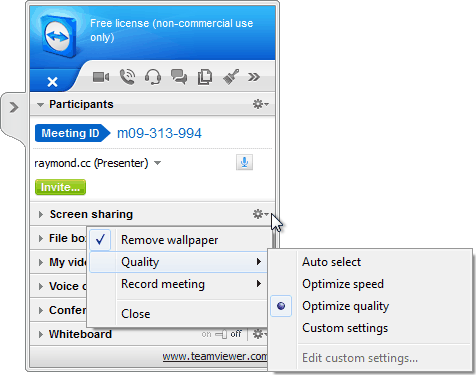 After doing further research, I found out that TeamViewer now offers online meeting! First thing I like about TeamViewer is they provide an option to run it without installation. If you prefer a portable ZIP version that can be run directly from a USB stick or a CD, they also have it on the download page but the file size is slightly bigger at 20MB compared to only 5MB installer. 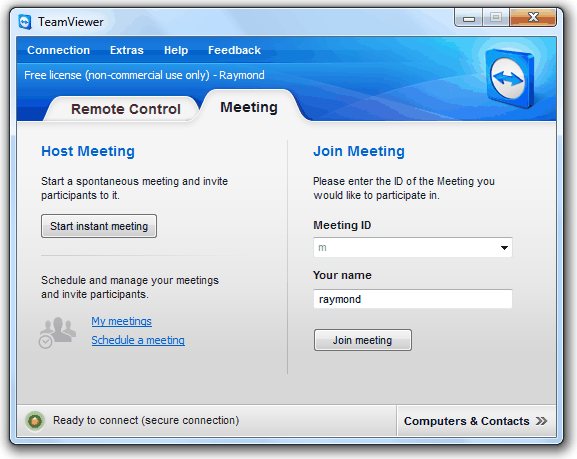 All participants must run TeamViewer in order to create and join online meetings. The presenter will have to first create a meeting by clicking on the Meeting tab, followed by clicking on the Start instant meeting button. Once the meeting has been created, a bar will appear at the right side of your screen with a Meeting ID which you need to give it to the person to join the meeting. The participant will also run TeamViewer, go to Meeting tab, enter the Meeting ID and their name followed by clicking the Join meeting button. Once connected, the presenter will have a lot of options to play with so let’s check it out. You can mute or unmute and allow or deny your participants to remote control the presenter’s computer. The invite button creates a ready made email message containing the meeting ID and the download link. You can also sent chat messages directly to the user by clicking on the username and then type your message on the Chat box. You can pause presentation or stop screen sharing. Pausing a presentation will only allow the participants to see the the last screen before presentation was paused. When stopped, the whole screen sharing will be removed but it is possible to share the screen again. You can also set which application that you want to share for further privacy. For example, selecting Firefox as the presenting screen will only show Firefox when the window is on top while others will be hidden in black background. By default wallpaper is automatically and temporarily removed when a meeting is created for a faster transfer. You can also set whether to optimize quality or speed and also record a meeting from here. The recordings will be saved in .tvs extension which can be opened with TeamViewer and converted to .AVI format. Both presenter and participants can share files by dropping files into the file box area. The files are not automatically downloaded or sent when shared but merely made available to download whenever the participants wants to. The presenter is able to deny participants from sharing files. This is a very useful feature where all participants can talk to each other using the microphone and speaker on their computers. Simply click on the Transmit my audio now link and start talking. You can increase/lower the volume and mute/unmute speakers and microphone. If the attendees doesn’t have a speaker or microphone but wants to take part in the conversation, they can use their phone to dial the provided number and enter the conference PIN on your telephone keypad. Attendees can draw on screen probably to highlight interesting things. Only the presenter can Save and Clear the drawings. In my opinion, the chatbox is a bit too small. If there are a few people typing at the same time or you don’t read fast enough, you will need to scroll up to read the posted chat messages. This will only appear if you click on the first video icon. Basically this feature allows you to transmit the video that is captured from your webcam. TeamViewer 7 is free for non-commercial use, runs on Windows, Mac, Linux and even Mobile devices, and most importantly packed with really useful features that blows away their competitors! TeamViewer 7 is definitely my current first choice when it comes to screen sharing or online meetings. Good I realized it when installed team viewer 4 days ago to help my client. Thank you very helpful, I also very like TeamViewer it’s the best remote desktop with so many features, and little troubles. Now with this conference features it’s unbeatable. The beta really paid off for this program. I’m hoping this goes system-wide soon.